Designed and developed as per the buyer's needs, our next variety is Blister Sealing Machine. The entire range of the Produced is made Under the guidance of professionals, thus quality is assured. Our machines are used in dairy and inner industries for packing of curd, yogurt, etc Buyers can get Blister Sealing Machines at fair market prices. With us, stay assured for timely deliveries. 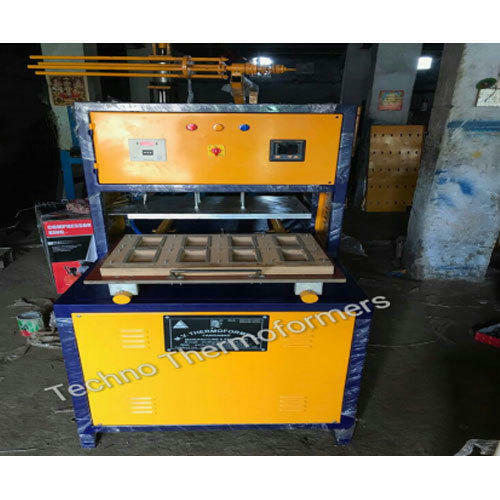 Incorporated in the year 2007, at Delhi, (India), we “Techno Thermoformers” are known as the prominent Manufacturer, Exporter and Wholesaler of Automatic Packing Forming Machine, Automatic Bister Forming Machine, Hydraulic Punch Cutting Machine, EPS Dona Plate forming Machine, Special Purpose Forming Machine, Blister Packaging Forming Machine etc. To ensure that our offered products are in-line with established quality standards of the industry, we manufacture these by making use of the high-grade raw material, sourced from the trusted vendors. Further, after the completion of the manufacturing process, we check these products on various stages by using latest technology so as to ensure their longer service life, less maintenance rust & wear resistance, precise design, fine finish and trouble-free performance. Furthermore, we offer these products to our esteemed clients in various customized options at affordable prices.